See that? "Choctaw Nation." I did a quick search in Amazon, looking for other books in which an author used "Choctaw Nation" in a book that has Choctaw characters in it. Know what I found? There's one author who has done it several times--Tim Tingle. Interestingly, my search didn't turn up many children's books (in fiction) with the word "Choctaw" in them. The ones I did get are by Tim, and I gotta say, that makes me happy because Tim knows what he is doing. He is Choctaw. That he uses the word 'Nation' in his books is important. It conveys a basic fact that most people are unaware of: there are over 500 Native Nations in the United States. We decide who are citizens are, and we have a unique relationship with the United States government because of treaties our heads-of-state made with U.S. heads-of-state. "Make sure Jumper does not catch any chickens!" My Mother always yelled this from the back porch. Think, for a moment, about the ways Native people are shown in popular works of historical fiction for children. Chances are, what came to your mind was tipis, and horses, buffaloes, and half-naked grunting Indian men of the kind that you got from Laura Ingalls Wilder in her book, set in 1869 (that was 39 years after the tribal nations of the southeast were moved to Indian Territory where they built houses with porches and schools, and towns... see why half-naked primitive Indians is incorrect?). With How I Became A Ghost, Tingle is giving us something quite different from Wilder's stereotypes. He's giving us reality. Isaac and his family have a house with a front porch, and a back porch, and a garden. Having those things doesn't make them less Native. 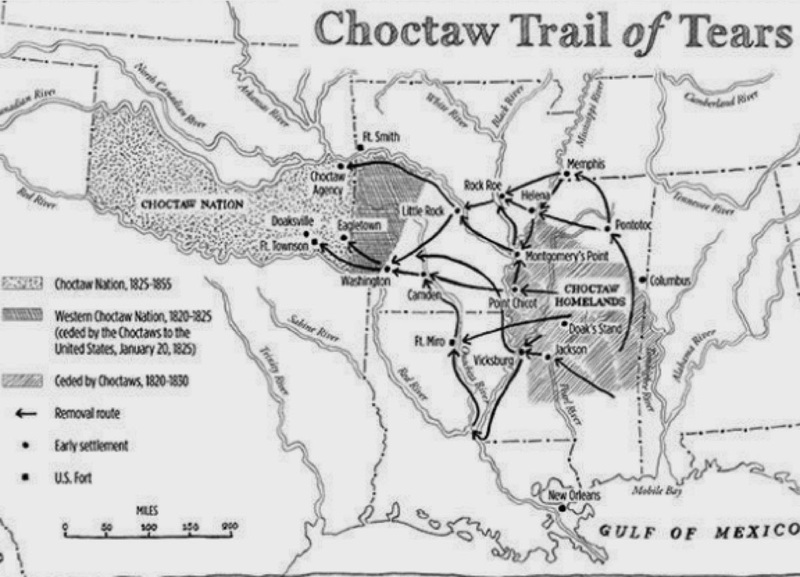 As you read through his story, you pick up on Choctaw ways of being that are very much part of their lives. Things like treaties are part of what the children know, too. "Treaty talk" is unsettling. With good reason. There is a terrible tendency for writers to make Native spirituality into some kind of mystical or magical thing. Tingle doesn't do that. He gives it to us in a matter-of-fact way. He gives us Christian spirituality in that way, too. In his story, it has become part of the Choctaw way. As the title suggests, Isaac is going to become a ghost, but this isn't a scary ghost story. Scary things do happen--this is a story about the forced relocation of a people, but it is more about the humanity of the people on that trail than it is about that forced relocation. How I Became A Ghost is about spirituality and community and perseverance. And laughter. There's some delightful moments in this story! Throughout, this story shines with the warmth that Tingle's storytelling voice brings to his writing. I highly recommend How I Became A Ghost. I have it on good authority that we'll hear more from Isaac. I look forward to it. 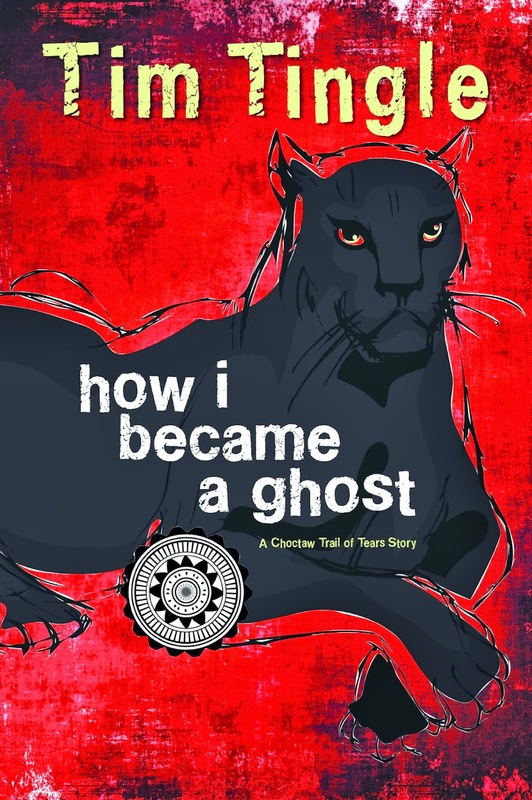 How I Became A Ghost was selected by the American Indian Library Association as the 2014 winner of its American Indian Youth Literature Award, at the middle-grade level. Published by RoadRunner Press, get it from a small bookstore if you can. I suggest you order it from Birchbark Books, a Native-owned bookstore in Minneapolis. Take a minute, too, to read the interview with Tingle at the TeachingBooks site. And listen to Tingle reading a bit of the book, too. Its exquisite. Great review - another "must read" to go on my list! As I recall, my great-great..... grandmother living in what was then Cherokee Nation also lived in a house complete with porch. Heck, they even had a newspaper! i have heard tim tingle tell stories a number of times, and he is among the best. i can'y wait to check out this book. I have a 6 near 7 year-old would this book be okay? He's quite bold & loves books. Rose--read the first chapter or two yourself and then decide. Cool that he loves to read! It is historical fiction. For something contemporary, check out Cynthia Leitich Smith's INDIAN SHOES.